German metal stalwarts Scorpions have returned with a new album that finds the long running outfit sounding as current as a band on its 35th year of existence can. 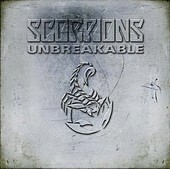 Unbreakable is billed as the band's return to the glorious metal sounds which yielded hits like "Rock You Like a Hurricane" and "Blackout", and while that sounds like an unrealistic goal, you can't deny how good vocalist Klaus Meine still sounds for a man in his early sixties, especially on the harder edged numbers like the first single "Love 'Em or Leave 'Em". The classic Scorps guitar stomp of master axmen Mathias Jabs and Rudolf Schenker is also prevalent here, as tracks such as the driving "Borderline" and fast paced "Blood Too Hot" are the heaviest cuts the band has recorded in over a decade. With a solid shot of hard rock injected back into its system, and armed with new blood on bass and drums (Pawel Maciwoda and James Kottak. respectively), these Scorpions still possess the sting that made the group an international metal sensation. With a career than spans four decades, Unbreakable finds the boys losing a step or two, but still in shape enough to show the new breed of rock stars what it takes to make it worldwide live.